Missing work reports signed and returned by Wednesday! Mr. DeGrandis will be available during study hall period 5 or after school Tuesday to help you catch up. Your copy of your Inside Out and Back Again. 3. refugee, n. (refugees) a person who has been forced to leave their country in order to escape war, persecution, or natural disaster. Many child refugees experience the horrors of war before they leave their home countries in order to find a safe place to live. 4. endure, v. (endures, enduring, endured) - to patiently suffer something painful or difficult; to remain in existence or last a long time. It is unbelievable that a child can endure such horrible living conditions yet still manage to smile. I can describe the difficulties Ha is going through as a result of her becoming a refugee. I can identify details in a text that illustrate the refugee experience from the point of view of child refugees in other countries. Listen to the poem "Saigon is Gone." (page 67) Ha is now a refugee. She has left her country to escape a war. What are some textual details you noticed about the conditions Ha must endure? Be prepared to share a response with the class! What's it's Like to be a Refugee? DIRECTIONS: As you watch the videos below, record at least three details from each set of videos you noticed and three details you wondered about on your Notice and Wonder Chart for inside Out and Back Again Poems! You will use this later for a group activity. SET 1: These videos are actual accounts narrated by child refugees. Their stories have been animated for clarity and maximum impact on the audience. 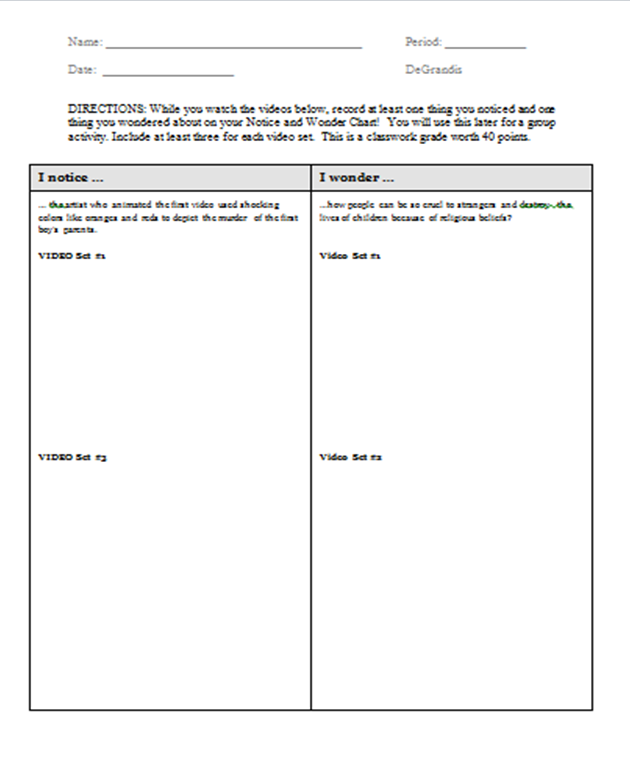 Read your notice and wonder chart to your partner. Listen while your partner reads their chart to you. Add at least one new detail to each set of videos from your partner's chart. Share at least one new detail to each set of videos for your partner's chart. Your copy of your collaborative essay (optional). You recently had the unique experience of writing an essay collaboratively with your team. In order to improve this essay writing process, your teacher is interested in your thoughts about it. Think back and reflect on your experience with the collaborative writing assignment you completed in which your team compared the fictional events of the novel Inside Out and Back Again by Thahanna Lai with the factual events described in the article, The Vietnam Wars by Ted Olsen. This assignment is due at the end of the period and will be a classwork grade worth 20 points! Reflect on your experience with the collaborative essay writing process. Decide if you think the process was more positive or negative for you. (Do not pick both!) Write a fully developed paragraph (TRE2E2S) in which you share your thoughts about the collaborative essay writing process. – Explanation: For each piece of evidence, an analysis or explanation: what does this evidence prove? I think the collaborative essay writing assignment was a positive experience for several reasons. This is because it helped improve my ability to analyze how informational texts relate to fictional texts and improved my writing skills. For example, working with a small group helped me come up with more ideas than if I had worked alone. My group came up with a connection between the texts I hadn't noticed. I didn't notice the connection between Ha's brother's story about the pilot that bombed the presidential palace and Ho Chi Minh's invasion of Vietnam. Another reason the collaborative essay writing activity was a positive is that it helped me improve my own writing skills. At one point, I offered an example of a connection between the texts that wasn't very good. One of the members of my group asked me to explain how my example connected to the topic sentence. I couldn't explain it because it really didn't support the topic sentence of our essay. I learned that I must be more careful selecting examples that I can fully explain. Overall, the collaborative essay writing assignment was a great way to help me improve my writing skills and analyze how informational texts can connect with fictional texts. Hand in your missing work report today! Mr. DeGrandis will be available during study hall period 5 or after school tomorrow to help you catch up. Begin final reading of Inside Out and Back Again.